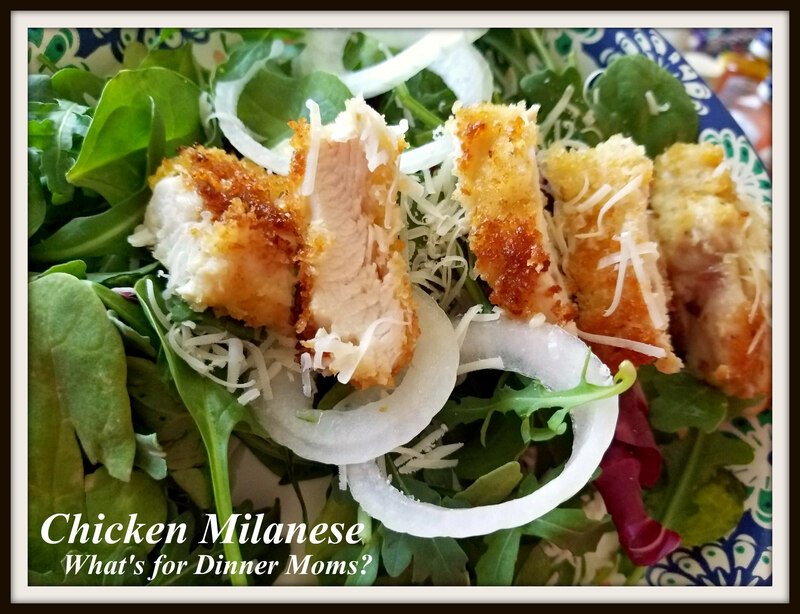 Chicken Milanese – What's for Dinner Moms? This is a favorite go-to meal of ours because it is so simple! Those days when you don’t know what you want for dinner or put off cooking hoping that they will all go get a bowl of cereal or pick at leftovers from the refrigerator, this meal could get you through those times. This is such a nice looking dish and such a simple dish all at the same time. My kids thought it was fancy while I thought about how I could put this together in 20-25 minutes! The Chicken Milanese served over a simple salad of greens, onions, and some shaved Parmesan cheese can be on your table in under 30 minutes. The chicken breasts are pounded down or sliced into cutlets then dipped in flour, egg, then bread crumbs and then pan-fried. So, simple! You can change the salad to suit your families tastes. Add vegetables, or other cheeses that they may like with the chicken breasts. The salad dressing can be a simple oil and vinegar or a fancy champagne one. It is all up to you! But a simple salad works perfectly with this dish. Preheat oven to 200 degrees. Working with one at a time, place chicken breasts on a cutting board, flat side down. Pound the chicken between pieces of plastic wrap until about 1/4 inch thick. Lightly beat eggs in a medium bowl. Place flour and breadcrumbs on two separate plates. Season eggs, flour, and chicken with salt and black pepper. Working with 1 cutlet at a time, dip into flour, turning to coat and shaking off excess. Dip into egg, and lift out, letting excess drip off. Dip into breadcrumbs, pressing firmly to help them adhere. Heat oil in a large skillet (oil should be between 1/4 and 1/2 inch deep) over medium-high heat until shimmering. Gently place 2 cutlets in skillet, and fry until undersides are golden brown, about 4 minutes. Flip cutlets, and fry until cooked through and golden brown on other side, about 2 1/2 minutes more (chicken should feel firm). Thinner cutlets will take less time to cook. Transfer to a paper-towel-lined baking sheet, and pat off excess oil. Keep warm in oven. Repeat with remaining cutlets, skimming brown bits and adding more oil if necessary. Serve over a simple salad, if desired. A favorite of my daughter when she was living in Argentina! Your post makes me want to try it! This is a wonderful meal everyone will like.